All-independently sprung successor to the Cortina, sold as 'man and machine in perfect harmony'. 14' 5" long by 5' 6" wide and weighing 969kg to 1194kg. Estates were 14' 9" long and saloons (called Sapphires, from March 1987) 14' 8" long. Multitude of different engine, gearbox, drive system and trim combinations, including a rare three-door hatchback with 1.3 and 1.6 engines also used for the Sierra Cosworth. 1294cc CVH had 60bhp; 1593cc Pinto had 73bhp; 1597cc CVH EMAX had 75bhp; 1796cc CVH had 89bhp; 1993cc single cam carb had 101bhp; 1993cc single cam injection had 115bhp; 1998cc twin cam carb from August 1989 had 107bhp; 1998cc twin cam injection had 123 to 125 bhp. Early 1993cc twin-cam rear drive Cosworth Turbos had 204bhp; later 4x4s had 220bhp in standard tune; 2933cc V6 had 150bhp. Early 2.0 litre four-speed versions were fast cars in their day with 9-second 0-60 and 120mph max. Last of the line 124bhp GT was a good run-out model. Cats can legally be removed from J-reg. XR4x4s had Cosworth four wheel drive system with 125bhp four or 150bhp V6. A lot of enthusiasm for 2.8 and 2.9 4x4s and, of course, all Cosworths. 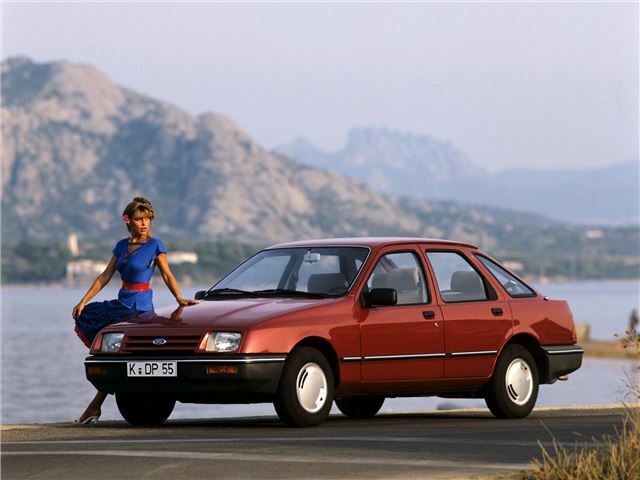 A good pre-cat Sierra should be cheaper to run than an early catted Mondeo. Survivors are getting old and tired and were never supposed to last 10 years-plus. On very early cars a small knock at the front could crumple the transmission tunnel, severely weakening the shell. Many have done huge mileages and the clocks may not be showing it. If 1.8 CVH engine cuts out the reason is usually wear to the fuel pump pushrod at the camshaft end. To check this, remove the fuel-pump and withdraw the pushrod. There should be a slight bevel on both ends but in most cases one end will be square across. It only needs to have worn by 2-3mm to cause problems. Check for every single trick in the book. Clockers. Cloners. Cut 'n' Shuts. Rust traps in doors (cured on later cars). Cracked heads and oil leaks on two litre twin-cams. If the steering feels unusually horrible the front suspension reaction arm bushes have gone. Treat all 4x4s and Cosworths with particular suspicion. Check their history with the club. 4x4s are apt to snap the front transfer case to final drive driveshaft. This is just the tip of the iceberg, so check everything.